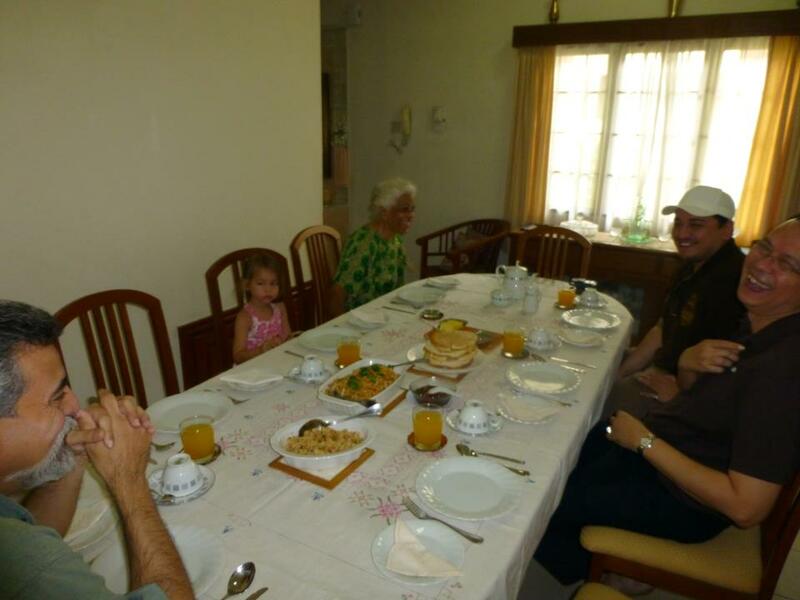 While waiting for the long process of RED TAPES to be able to start work in Malaysia, I was staying with my wife’s cousin, late Daw Pyone Ma Ma @ Puan Zabura, wife of late Captain U Khin Maung Latt @ Hassan Latt. 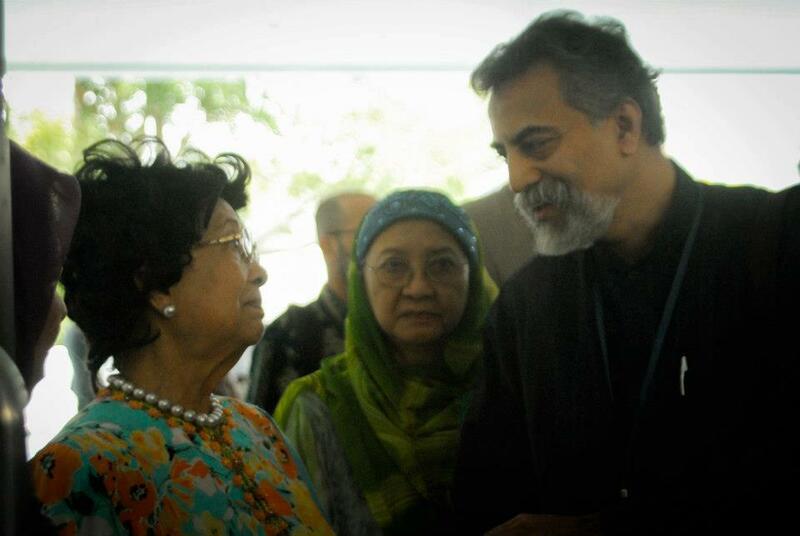 As she was working in University Malaya as the only Burmese Teacher/Lecturer, I frequently followed them to UM. I applied to the Anatomy Department and also applied for my two brother-in-laws there in UHKL. After 1988 there was an exodus of Burmese Lecturers and Professors. I sent many of them, personally to see the Head of Departments in UM/UHKL, obtained the application forms for them and helped to fill up the forms and sent by hand and by posts. But before they got their replies they got the jobs in Saudi Arabia, UK, US, Brunei and Singapore etc. 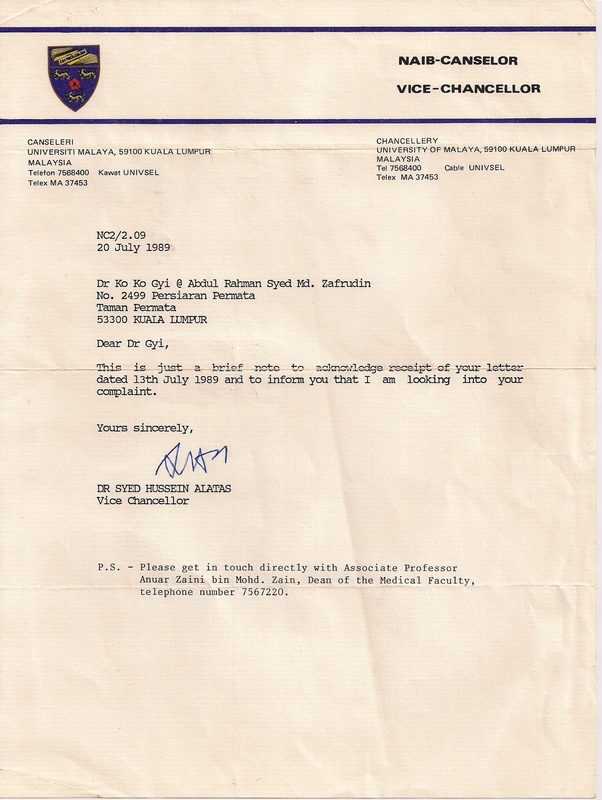 Later when I read the news about more than 250 Medical Officer posts vacancy and problem of lack of specialists there in UHKL and UM, I wrote an historical letter to the Vice Chancellor, the late Professor Syed Husain Alatas. Although he would not know me, I knew his almost entire history. His ancestors were from Indonesia, about his books, his job in Singapore, his political life as a founder of Garakan and he was the one who brought the Gerakan into Allience/BN after the emergency etc. I continued with the list of Burmese specialists who applied but failed to get job or even the acknowledged receipt of applications in UM/UHKL but managed to get the jobs in other countries and condemned the inefficiency of UM/UHKL admin authorities and departments’ head who even failed to give the acknowledged receipts. I sent the copy of the acknowledged receipt from my letter to UK which arrived within seven days. I asked why UM/UHKL failed to engaged with Burmese doctors and specialists when even the Malaysian government is employing Burmese doctors with the G to G or government to government contract and that many Burmese doctors and specialists are working in other universities e.g. UKM, USM, UIA etc. I questioned him about how the few hundreds of vacancies could be filled up with the US or UK or Australian doctors as the salary his UM/UHKL university could afford to pay is so low like the salary of ambulance drivers. I commented his abilities as an academician in Singapore and the old lecturer of the present education minister and the inefficiency of the jealous officers of UM who are attacking him. I advised him to tap the Brain Drain of Burma, to get a Brain Gain for Malaysia. Although he advised me to contact the Dean of Medical Faculty of UM, AP Dr Anwar Zaini I never called him. The rest is history; VC’s PA called me to report and see the Anatomy Head of Department. VC ordered to Photostat my letter and to distribute to all the Heads of the Departments of UM/UHKL. Although they resist my appointment and delayed for a log time, at last they decided to go to Burma to recruit the specialists. But I was the first Medical Office and the first MSc student in UM/UHKL in the recent history because of Education Minister DSAI’s Political Secretary Encik Azmin’s kind help of sending my application letter to the Chairman of the Board of Directors of UHKL, Toh Puan Dr Aisah Onn, now the Pro Chancellor of UM. The Director of UHKL sent to me the copy of his reply letter to Encik Azmin Ali stating that they are willing to employ me. But the MMC’s anti-foreign doctor policy delayed my transfer from PERKIM, delayed the training, MSc classes and MO posts. Just read Tun Dr M’s posting in his blog about the Xenophobic, selfish and jealous Malaysian “THE DOCTORS“. After they got the taste of the hard work of a Burmese doctors, they continue to engage the service of other Burmese doctors and specialists and continuously accepted many Burmese doctors (many of them are non Muslims as they are not Xenophobic or Racial like many doctors/specialists under General Ne Win’s government. Nowadays Myanmar Government is graciously allowing back the Myanmar Muslims to attend the post graduate courses and even my no. 8 and youngest brother, who was my student in Anatomy and Surgery is allowed to attend MSc and he is a consultant Cardiac Surgeon back there in Myanmar. This great man, late Prof Syed Hussein Allatas later continue to work in UKM and became the patient and godfather of my brother-in-law, who was working as an MO in UKM clinic for students and staff. Actually I mentioned my two brother-in-laws name in the complaint letter but Dr Ali and I had never mentioned this to him. I only complaint to him that their MO applications were also ignored together with the numerous Burmese Specialists job applications by the relevant authorities of UM and UHKL. At the time of Dr Ali’s father U Kyaw Kyaw “>Kyaw’s funeral former UM VC, the late Professor Syed Husain Alatas came very early. When we were waiting in the mosque while bathing of late U Kyaw Kyaw, I had a very strong desire to self introduce to him and reveal about my letter but I thought it was not right and no an appropriate time for that because of my heart felt sorrow for my Uncle’s funeral. During the last class=”hiddenSpellError” pre=”last “>Hari Raya, Dr Ali told me that he was going to see the wife of the Prof. and I ased him whether I could follow him to see her. He agreed and while I was preparing to follow Dr Ali, a friend visited us and I had to cancel the visit. Later, Dr Ali told me about meeting Dr Chandra Muzafa, Just World President there. Dr Chandra Muzafa revealed that the late Prof was the one who converted him into Islam and Muzafa was the name given by the late Prof.
Prof was the founder of “>Garakan party and the one who brought Garakan into the ruling BN’s fold. This entry was posted on October 17, 2009 at 7:42 am and is filed under Uncategorized. You can follow any responses to this entry through the RSS 2.0 feed. You can leave a response, or trackback from your own site. Could email me your email address as I have a similar problem. Thanks. COMMENT | Earlier this month, I returned from our home in Kuala Lumpur, where I spent 10 days in the study of my late grandfather, Syed Hussein Alatas, or Jid, as I called him. My task was to assist my father in looking through what seemed to be never-ending stacks of files and cardboard boxes that were laid all across the perimeter of the room. These files and boxes contained numerous newspaper clippings, old photographs, letters of correspondence, manuscripts, tiny scraps of paper on which my grandfather wrote pantun, notes about books he read or from conferences that he attended, and of course many books and journals. I admit that at first, I thought it was going to be a daunting task to complete. However, all that changed when I actually started looking through the files and realised how fascinating it was to have the opportunity to be doing so. In fact, I got distracted quite often. I stopped my work a number of times so that I could take a picture of a beautiful pantun that I found, or to read a whole newspaper article which Jid wrote or was featured in, or to marvel at a picture of him. At the end of the 10 days in his study, looking at everything we had done, I was glad that we had accomplished so much but I felt more grateful for the heart-warming experience of getting a glimpse of what a part of my grandfather’s daily life might have been like. I first started with the files of newspaper clippings which he had kept from the 1950s all the way to the early years of 2000. Each article was pasted on a blank piece of paper so that they could be neatly compiled in their respective files. Of all the files that I looked through, I was particularly drawn to the files from 1988 and 1989. While slowly flipping through the pages, looking at which articles needed to be kept, I noticed that many of them were about affairs concerning Universiti Malaya (UM), and I wondered why he kept so many articles about UM. It wasn’t until I came across an article about the “new vice-chancellor” that I remembered that 1988 was the year in which he was appointed vice-chancellor of UM. As the vice-chancellor, it was definitely important to him to always be informed about the affairs of the university and the local education system. In these files, a number of the articles were about student protests against a Sheila Majid concert in 1989, the occurrence of ragging during university orientation programmes, and the importance of the English language for Malaysian students. In addition to issues about the university, he also kept articles about general affairs in Malaysia, such as politics, the economy, and the problems of poverty and corruption. As I was looking through these articles, I happened to chance upon a crossword puzzle from 1988 which he had filled in. It was on the reverse side of a newspaper clipping that he had kept. Nothing in particular had led me to look at the reverse side of the clipping, but if I hadn’t done so, I would not have found this little treasure. One of the words that he had filled in was ‘rasuah’, or corruption. Fully aware that corruption was something that Jid wrote and spoke about a lot, looking at it made me smile and wonder if he had chanced upon number 31 under ‘melintang’, seeing that it said ‘tumbuk rusuk’, and then decided to fill in the whole puzzle. Or were crossword puzzles a regular opportunity for him to exercise his mind? Looking through these newspaper clippings and finding the crossword puzzle made me pause to picture what his day would have been like. I imagined him reading the newspapers in the morning, with a cup of coffee on the table beside him, and labelling the articles that he wanted to keep. Would he cut them out on the day itself? Or perhaps he would wait till the weekend so he could cut out all the labelled articles for the week, after which he would diligently paste them on separate papers. Would he then discuss these issues at the dinner table? But there weren’t just newspaper articles in his study. As I mentioned earlier, there were many books and journals which were mostly about different religions and the importance of inter-religious dialogue, the relation between science and religion, and various topics relating to politics, history and sociology. While I was classifying these books and journals, I was reminded of the Sundays when we would go to Amcorp Mall to buy second-hand books, and he would buy books about anything and everything. He always read widely and had no boundaries when it came to acquiring knowledge. Interestingly, in an article that he wrote for Malaysian Business, he said that during his days as a student, he spent a lot of time reading about history, philosophy and science after school hours or during the holidays. His learning was not just restricted to the classroom. However, newspaper articles, books and journals were just a small part of Jid’s daily life. While they tell us the story about his concerns, interests and writings, there was more to his days than just cutting out newspaper articles and reading books and journals. Tucked away in brown envelopes, I found pictures of him during his travels to countries where he was invited to present papers at conferences. One of the things that made me smile when looking at these pictures was that he never seemed to miss an opportunity to smoke his pipe. In pictures where he was standing in front of a cultural or historical landmark, he would often be pictured with a pipe in his hand. And it wasn’t just the pictures that told stories of his travels. He even wrote about his travels abroad, and I found a pantun that he had written while he was in Japan. Reading this and other pantun brought back memories of how Jid sometimes wrote poems for me on tiny pieces of paper. Sometimes, he would invite me to sit beside him to press the tobacco into his pipe and blow out the matchstick, because he knew I liked doing that. After that, he would pick up his ballpoint pen and start writing, and would sometimes even draw random caricatures. At the end of the 10 days in that study, my father and I remarked on how much we had accomplished and how we had succeeded in compartmentalising everything in storage boxes. But there was more to the 10 days than just the end product of organising Jid’s things. The newspaper clippings, books and journals didn’t just give me a glimpse of what part of his daily life might have been like, but they also reminded me of his thirst for knowledge and the importance he gave to social awareness and intellectual curiosity. Just as his own learning continued outside of the classroom, he also reminded me that while doing well in school was good, reading books outside of school was also important. Nevertheless, Jid’s life wasn’t just about reading newspapers and books or attending conferences. His writing of pantun, whether it was during his travels or simply based on a thought that had come to him while possibly smoking his pipe, demonstrated Jid’s artistic side and allowed me to see the world vicariously through his words. Being in Jid’s study was and is not just about the physical presence of being there. It is also about the emotions, memories and imaginations that come along with it. SHARIFAH AFRA ALATAS is currently majoring in History at the National University of Singapore, where she is also involved in promoting interfaith dialogue. Besides her love for cats, she enjoys reading historical novels and indulging in funny 9gag videos with her brothers.